Completely revised and updated since publication of the highly-valued first edition in 2002, the Oxford Textbook of Endocrinology and Diabetes second edition provides an up-to-date, stimulating and comprehensive account of endocrinology and diabetes. Containing first rate, pragmatic advice on diagnosis and clear guidelines for recommended management, it also covers the scientific principles that underlie medical practice. Review from a previous edition: The work of Wass and Stewart should be in every medical library and I recommend that every endocrinologists gets a copy. Review from a previous edition: For someone who is fond of Endocrinology was a pleasure to open this book. It is a classic textbook in endocrinology and diabetes, as well as being contemporary in language, content and illustrations. 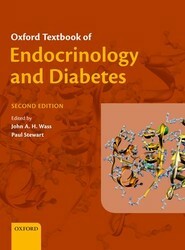 I recommend the book to anyone who needs a large and updated textbook of endocrinology and diabetes.